In the year 2517, humanity's last hope is with Dr. Catherine Halsey, the SPARTAN-II program, and one six-year-old boy: John-117. 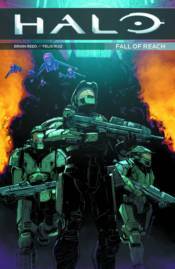 Kidnapped and ruthlessly trained, John endures and rises as the leader of the Spartans: he becomes the Master Chief! These legendary heroes are entrusted with stopping the Covenant at all costs�but will their harrowing biological augmentation and unparalleled MJOLNIR armor be enough to rise to victory?